Ruby Bingo invite you to play in a massive free bingo extravaganza which takes place three times a day. They just love to dish out free bingo money, which is why you need to be at Ruby Bingo at 12:30 PM, 3:30 PM, and 7:30 PM daily. This is your chance to win £2, £3, or £5 cash prizes — get to the aptly named Barmy Club for more free bingo fun than you can shake a bingo ball at. And if you like things to move fast and furious, get to the High Velocity 57 games which take place at 12 PM, 4 PM and 11 PM. You’re sure to be on cloud nine in the Cloud Nine room, as you take advantage of the new twist that Ruby Bingo have added to these games. Now the jackpot grows by £1 every game, making it even easier to you to win at 57 balls. Bingo on the blackout pattern to scoop the top prize. Cloud Nine is also where you will find the Pattern of the Month game. It can pop up any time throughout the night or day — if you are the single game winner who is active in the chat rooms, the chat master will credit your account with 10BBs. For October, the pattern is a pumpkin. And every cloud has a Silver Lining, especially in the Cloud Nine room. At the top of every hour in the Cloud Nine room, for the hours of 1 PM, 3 PM and 8 PM, you can play for a minimum of a £25 prize, with tickets costing just 25P. 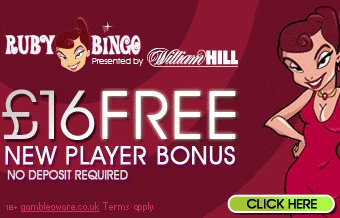 Play bingo online at Ruby Bingo today – it’s a gem of an online bingo site.